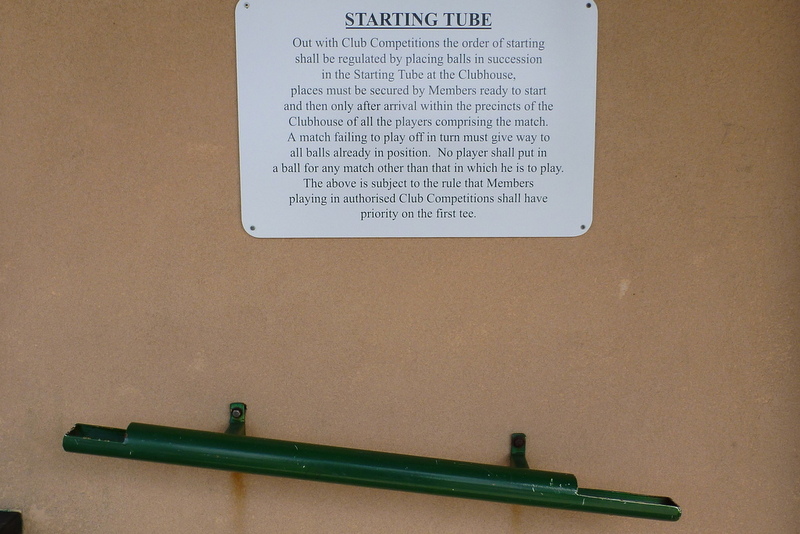 Cruden Bay Golf Club, Scotland, 2008. That's the green of the fifth hole, a par 5, in the upper right-hand corner. At five o’clock yesterday afternoon, I stopped by Cruden Bay Golf Club, in northeastern Scotland, on my way back to my hotel. I had played there the day before, and I thought maybe the pro would let me sneak out for five or six holes before dinner. He said OK–but the course was empty, so why stop? Snow began falling as I teed off on 5, but the sun was out again by the time I reached the green. I ended up playing all 18, in a little over two hours, and then ate dinner in the clubhouse, which has huge windows that overlook most of the course. Spring snow, Cruden Bay, Scotland, April 2012. 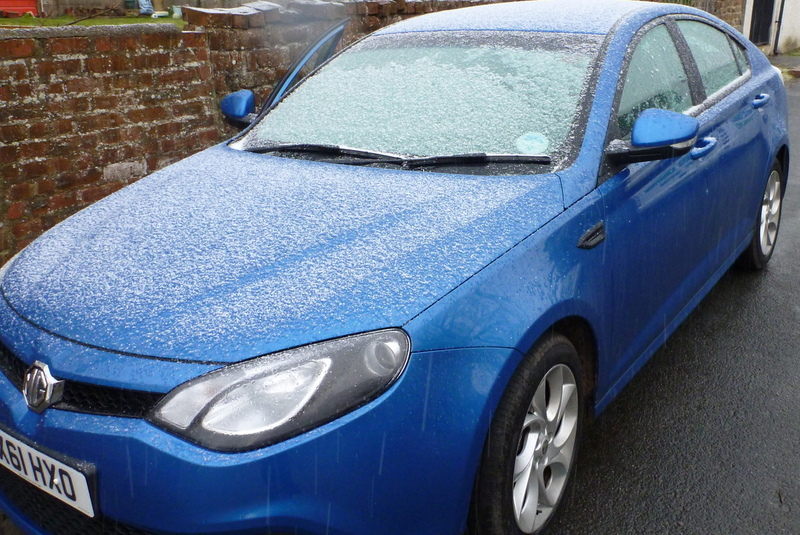 This morning, there was snow on my rental car, which is a kind of MG I’d never seen before, and I had to scrape the windshield with one of my golf shoes. 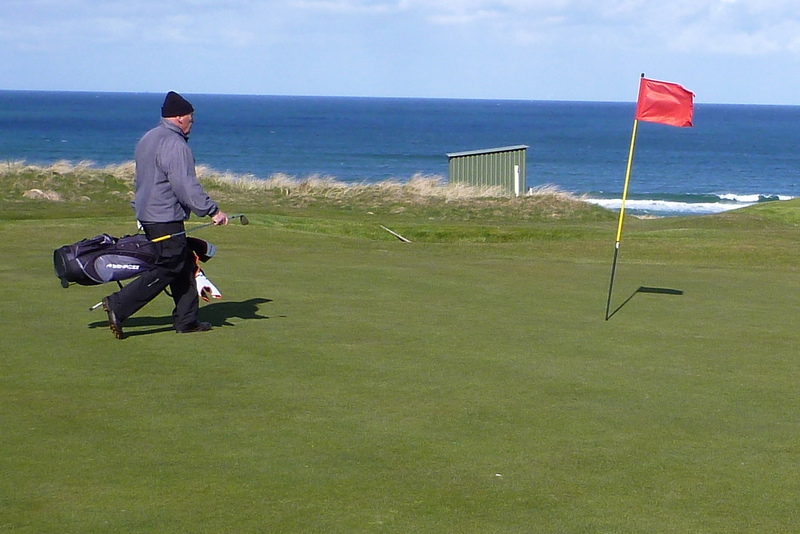 I played at 8:00 at Fraserburgh Golf Club, a wonderful links course up the coast from Cruden Bay. The Sunday-morning regulars at Fraserburgh choose teams the way my friends and I usually do at home, by pulling balls out of someone’s hat. The temperature was in the mid-30s, and the wind was blowing hard. The golfers below fortified themselves with quite a lot of Budweiser, which one of them referred to as coffee. 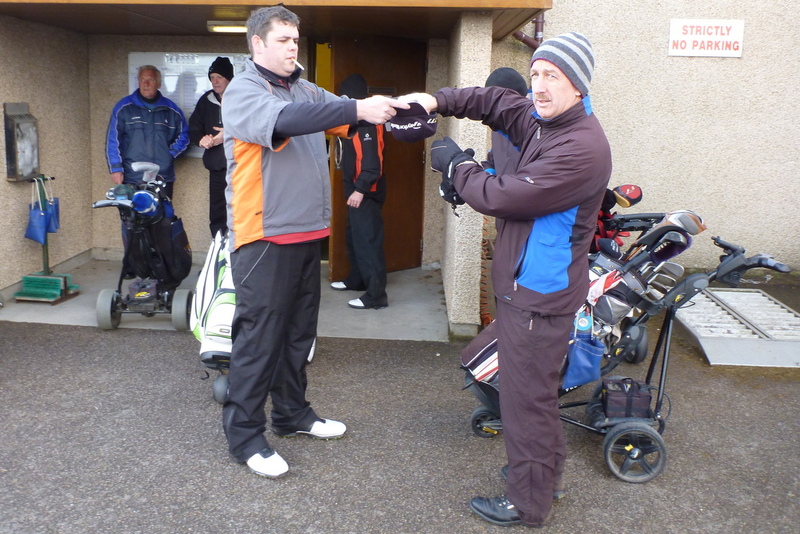 Choosing teams, Fraserburgh Golf Club, Scotland, April 2012. 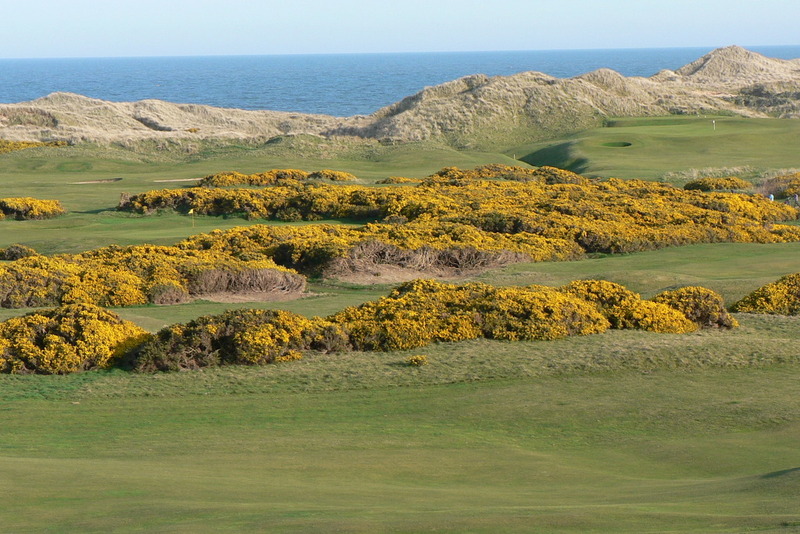 Peterhead Golf Club, Scotland, April 2012. I played with Peterhead’s pro, Harry Dougal, who has a crushing handshake and sometimes carries his golf bag like a briefcase. He lost his wife in a car accident eight years ago. He said that swallows nest in the club’s rain shelters–that green shed in the photo is one of them–and return (from South Africa) on the same day every year. Harry Dougal, Peterhead Golf Club. Snow fell hard a couple of holes before I took the photograph above, but it didn’t last very long. I brought four pairs of rain gloves on this trip, and I’ve worn them every round, for warmth. I’ve wiped my nose on them so often that they’re all sort of shiny and stiff. At Fraserburgh, I played with a semi-retired furniture-store owner and a semi-retired fisherman. The fisherman didn’t wear gloves of any kind, because a fisherman’s hands, by comparison with fishing, are never cold. This entry was posted in Back-Roads Scotland, Games, Golf Courses, Scotland and tagged Cruden Bay, Fraserburgh, Peterhead by David Owen. Bookmark the permalink.